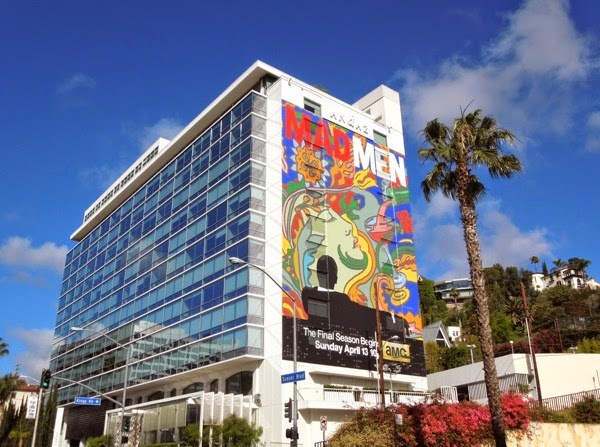 Those Mad Men (and women) of New York City's Madison Avenue are back and this time they're groovy, baby. 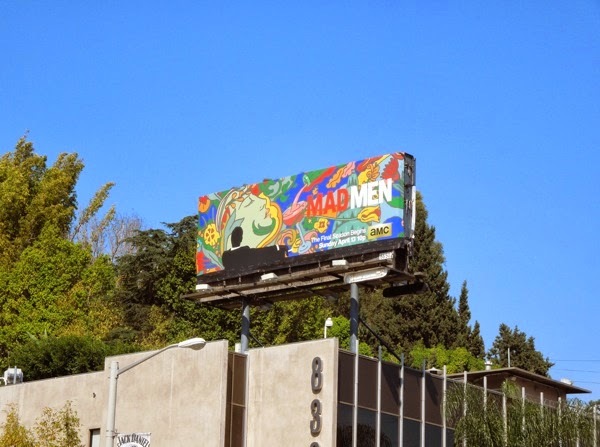 The psychedelic 70's are coming and so to is the end of this critically-acclaimed series, as Mad Men enters its seventh and final season. 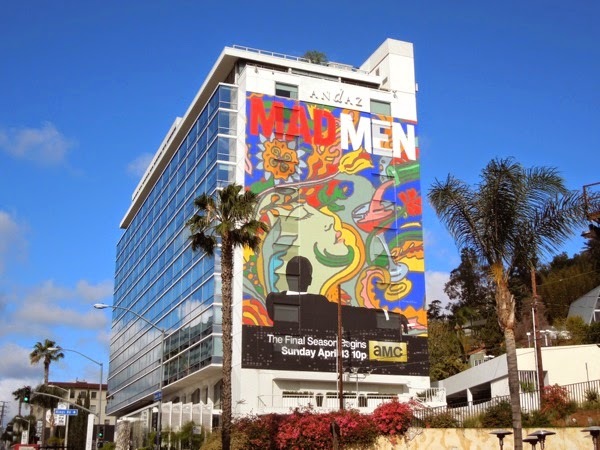 But don't despair yet, it looks like AMC plan to split the season like they did with Breaking Bad's final season, so they can give an even bigger push for those final episodes (and no doubt another wave of billboard creatives too). 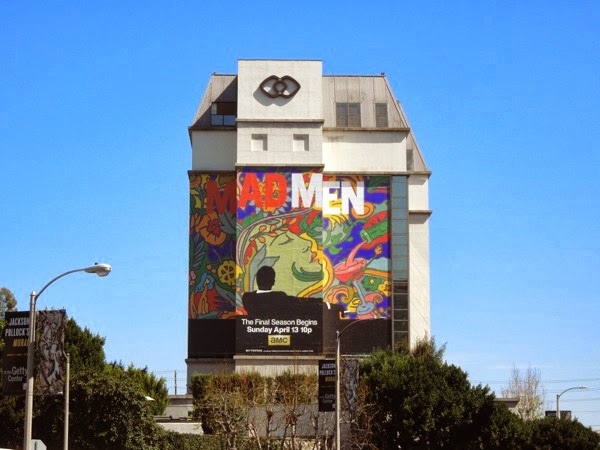 As the end draws near, the promo advertising for the series comes full circle as what's old is new again in this postmodern world. 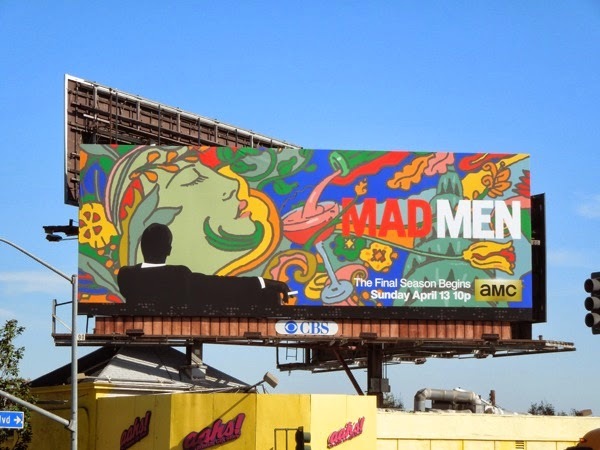 The now iconic series premiere image of 'Don Draper' reclining on a chair and smoking a cigarette is replicated for this seventh season ad creative, and updated with a psychedelic pop art burst of colour and mix of hippie women, cocktails and New York landmarks (the infamous and instantly recognizable art deco spire of the Chrysler Building). 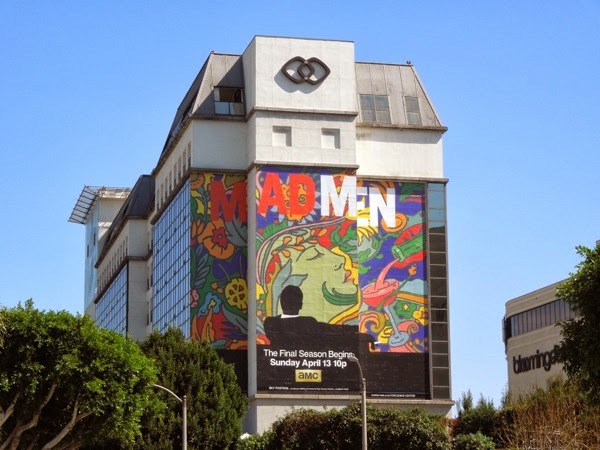 This giant-sized final season billboard was snapped on the side of the Sofitel Hotel along Beverly Boulevard, the standard landscape billboards and smaller ad were spied in multiple locations along L.A.'s busy Sunset Boulevard, plus along Highland Avenue on March 12, 2014. 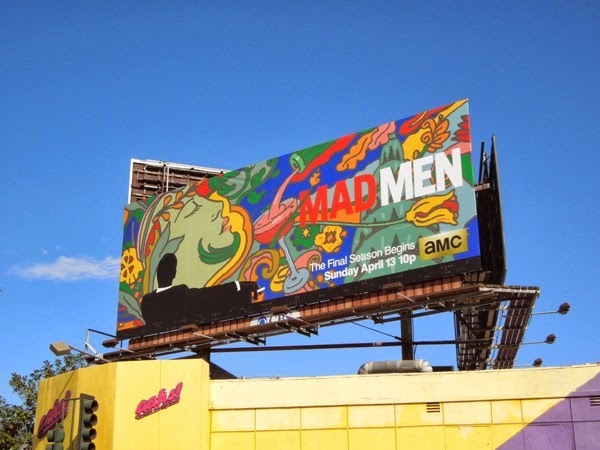 If you like this season seven ad creative, be sure to check out these Mad Men season promo billboards from years past, which have certainly lived up to the responsibility of creatively advertising a show about the pioneering New York ad agency world of the 60's. Last season Don Draper had reverted to his womanizing ways, alienating friends and family alike, although he was slightly redeemed in the season finale by opening up to his children about his painful childhood. Where will the hand of fate take him and the likes of Peggy, Joan, Betty, Pete and Roger next, and more importantly where will they end up when the period drama series comes to a close. 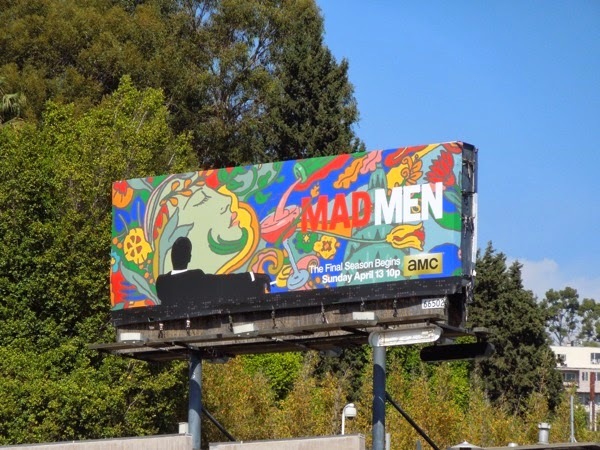 UPDATED: The end may be nigh for Mad Men, but that doesn't mean they can't go out with a giant spectacle, or two. 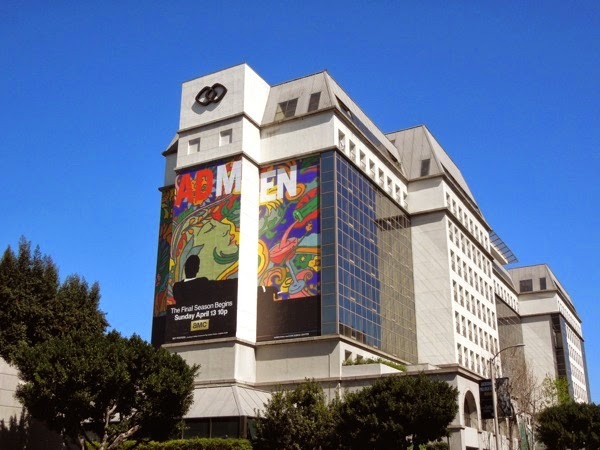 AMC has recently added a second super-sized final season billboard on the side of the Andaz Hotel in West Hollywood. 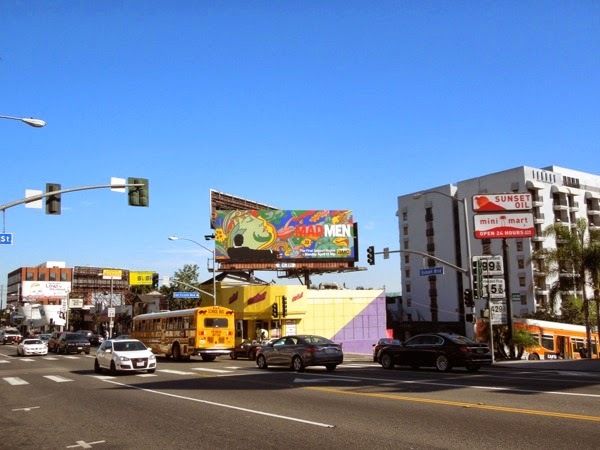 This giant groovy wallscape was snapped on April 1, 2014, westbound along L.A.'s busy Sunset Strip. 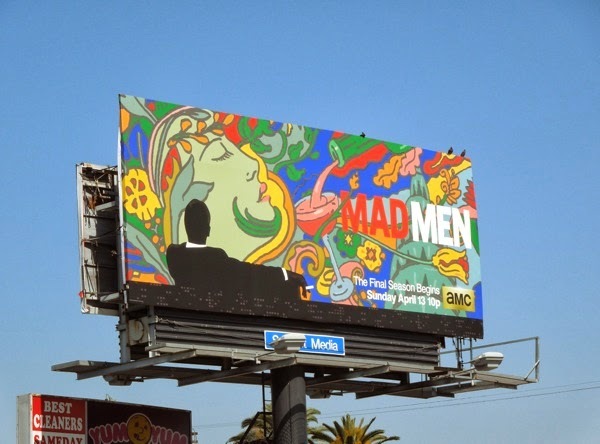 The psychedelic image itself was created for the show by iconic graphic designer Milton Glaser.